Reset oil service light Mitsubishi Outlander. From years: 2007, 2008, 2009, 2010. 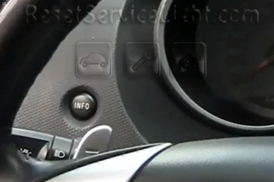 How to reset oil service light Mitsubishi Outlander (CW_W). Lightly press the multi-information meter switch until the information screen switches to service reminder display screen. Picture below. Press and hold the multi-information meter switch for about 2 seconds or more to display the (wrench icon) and make it flash. Picture below. Lightly press the multi-information meter switch while the icon is flashing to change the display from “- – -” to “CLEAR”. After this, the time until the next periodic inspection will be displayed. Picture below. 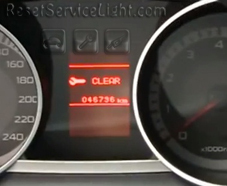 That it is the full procedure how to reset oil service light Mitsubishi Outlander. If you like to reset any maintenance oil light after an oil change. Or reset check engine light, airbag light, inspection key or insp errors when maint reqd, for Mitsubishi cars. Or any warning light for service reminder which appears on the display. Write in the search box the car name for which you want to find information, and find how to reset other service reminders when by yourself. I tried the procedure but didn’t work. The wrench symbol just blinks and no change. I noticed the year for which this blog is for notes up to 2010, my outlander is a 2013. Could it be a different procedure for this year? 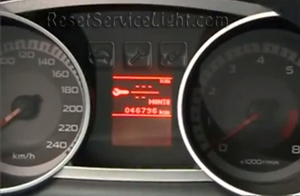 If you have tried this procedure how to reset warning light and it did not work means that the procedure is the same for Mitsubishi Outlander from 2013. You have Mitsubishi Outlander second generation or third generation ? I have Mistubushi Outlander I tried the procedure but didn’t work. My own is 2013 not 2010 pls I need you help tanx. You have an Outlander third generation, i don’t think that you can reset the warning service light like second generation. I have not seen a model like yours to try the procedure. I reset maintenance light somehow I went past the recommended 7500/6mths and ended up with 14000/13months, I did see the 7500 after my reset but when I went back to re check again to be sure ( after having reset by starting car) I some how got it to set to that 14000/13month, Is it ok to leave it there? I have tried to go back to 7500 but it will not change one the wrench is blinking. It’s ok if you’re not bothered about it. Hi! I had the same issue as Sue but mine is now at 25 months. How do I reset it back to 13 months please? Thank you so much for your help. We will return step by step on this procedure how to change the time for you inspection service. Did the same thing as Don. I would like this procedure as well. I also tried as stated but all in vain. Hi I have the tires replaced with different tires after I hit a boulevard. So after the tires were replaced the same light is still on it says Service Required. Can you explain what that could mean because I need my vehicle to travel out of town. This means that you must change the engine oil and filters. Please tell me what car do you have. I have a Mitsubishi ASX 1.8 DID 2010. I’ve got he “check engine oil level” meaning the particle filter process did not finish several times and diesel entered the oil chamber raising oil level. I’ve replaced the oil but the warning keeps displaying. Tried a OBD connection but this message is not displayed on the ECU. how can I reset this warning? I will search a solution and return to you. Everyone who reset their maintenance clock and went over like me, we are screwed… Notice the admin never came back with the answer like he said he would? I called Mitsubishi service and they said it CAN NOT be changed backwards…. Just wait and manually watch it until you catch up. Poor design!!! Hello Bruce, our auto mechanics are still searching to see if we can solve this problem. Unfortunately the place where we are Mitsubishi is a very rarely met car. We do everything possible to find one and try to see how to fix this problem.